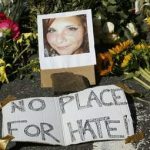 Heather Heyer lost her life to a 20-year-old Neo-Nazi protestor. I have been to Charlottesville, Virginia many times. Each time I have been impressed by the peaceful nature of the city and the loving attitude of its citizens. I was well-received at its literary festival, welcomed at its farmer's market and shown respect by its professional community and enjoyed excellent service in its restaurants and entertainment establishment. As an African- American I felt completely at home. If it wasn't for an unexpected visit from out of town relatives, I would have been in Charlottesville the weekend of August 12. Because of my knowledge of Charlottesville, I was especially surprised, even shocked to learn that White Nationalists, Neo-Nazis and members of the Ku Klux Klan had converged on the city in what turned out to be a hate filled rally billed as "Unite the Right." It wasn't just that these groups had gathered but the anti-black and the antisemitic words that came out of their mouths that fanned tempers. These negative protesters had come from out of town motivated to protest a plan to remove a statue of Confederate, General Robert E. Lee from a public park. They arrived in the thousands but the people of Charlottesville also rallied as counter-protesters to defend the honor of their city. It was unbelievable, even surreal to witness the clashes between the opposing groups on the street. One man was seen picking up a newspaper box to throw at another person. It appeared that the alt-right groups were more driven by anger. This point was made terribly clear when Nazi sympathizer, James Alex Fields sped his car into a crowd of counter-protesters killing 32-year-old Heather Heyer and wounding 19 other people. That such murderous impulse could arise from a dispute over the placement of a statue is deeply disturbing. What was more disturbing is that the president could not bring himself to recognize the inherent evil in such groups as Neo-Nazis, White Nationalists, and the Ku klux Klan, all organizations which openly espouse their hatred for people of other races. Under any other circumstances, the intentional ramming of a car into a crowd of people would be declared an act of terrorism. In this case, Domestic Terrorism but President Trump could not bring himself to make this declaration. While he did say that Americans needed to love each other, he also blamed "many sides" for the violence. The counter-protesters killed no one. One thing we have learned from the Taliban and Isis is when the seed of hatred is planted in a person's mind they become easy to radicalize. We are told that Fields idolized Hitler and identified with the Nazi party. Even though he was only 20-years-old negative views festered within his mind to the point he was willing to kill. We have seen this in terrorists throughout the world, most recently in another 20-year-old in Barcelona, Spain. He drove his van into a crowd of tourists. This incident also resulted in death. Words do matter. When they promote division and racial hatred no good thing can come of them. Have we forgotten the mantra that is the pledge of allegiance, "One nation under God, indivisible, with liberty and justice for all." It was a promise even for the disenfranchised that they would not be forgotten for long. It offered hope to all citizens of the country. By pledging to "One nation under God, we placed God as our highest ideal. In so far as this has become less true many Americans have lost virtue. Those who reject the spiritual view of the country can more easily fall under the sway of radical ideas. Politics can not heal us but a return to God can. Such a pilgrimage can take us out of our limited ego conceptions to see the oneness of humanity. Spiritual infusion causes us to transcend our egos and embrace others as ourselves. There is no excuse for violence because we have a difference of opinion, no reason to want to kill because you are on a different side of a rally. When such things happen we must recognize that the perpetrators are evil, and we must not shelter nor make excuses for them. It's okay to be on a different side of an issue, even a controversial one. It is not okay to allow hate to seep into your consciousness and for you to become destructive. When we stand back far enough and meditate on the circumstances we can see that violence makes no sense and creates more problems than it can ever solve. By all accounts, Heather Heyer was a loving woman who did not judge people by their racial identity. She gave her life defending that view. Her sacrifice is an inspiration to many of us and is made especially significant because she was Caucasian. It would be great if we could see ourselves as children of God, first and secondly as all Americans. If we could do that animosity and division would melt away. Fortunately, there are always those among us who can embrace this universal view of mankind. We must intensify our prayers and meditation to affect the consciousness of our fellow man. Perhaps, then we can become instruments of peace. "Blessed are the peace-makers, for they shall be called the children of God."